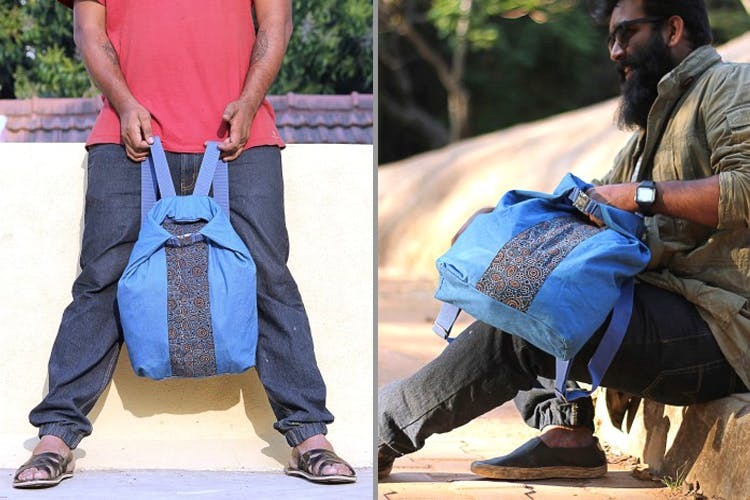 Bangalore-based Motifs of the Earth makes super durable and functional traveller bags made from apparently 100 per cent natural and sustainable materials. Plus, they have already made it to our list of upcoming designers you need to check out. Motifs of the Earth is a design studio that works on creating ecologically conscious alternatives to useful everyday products Currently working on a range of entirely vegan traveller bags called The Traveler Bag, these knapsacks caught our attention for their cool and convenient design. These bags can be rolled up into the size of a fist, making it easy to pack and carry around. Working with local artisans, Motifs of the Earth’s line of traveller bags are made completely from natural and sustainable materials like canvas, making them strong and durable. A result of the natural dyes and block prints they use, these bags come in a fun colour palette to choose from. We spotted some really cool prints in mustards, greens and rusty reds that we’re loving. If you’re one to keep things simple, these bags come in block colours as well in understated greys, navy blues and military greens. Bag one of these babies for a starting price of INR 2,150. You can buy these bags off websites like Unfactory here. Or you could catch their stalls at flea markets like the Sunday Soul Sante and Kitsch Mandi, where these guys usually set up shop. The brand is currently working on an upgraded version of their traveller bag, so keep a lookout for that.